Russia's Foreign Minister Sergey Lavrov, left, and his Japanese counterpart Fumio Kishida in Tokyo, Japan, Friday, April 15, 2016. Stage set for Putin’s Japan visit. 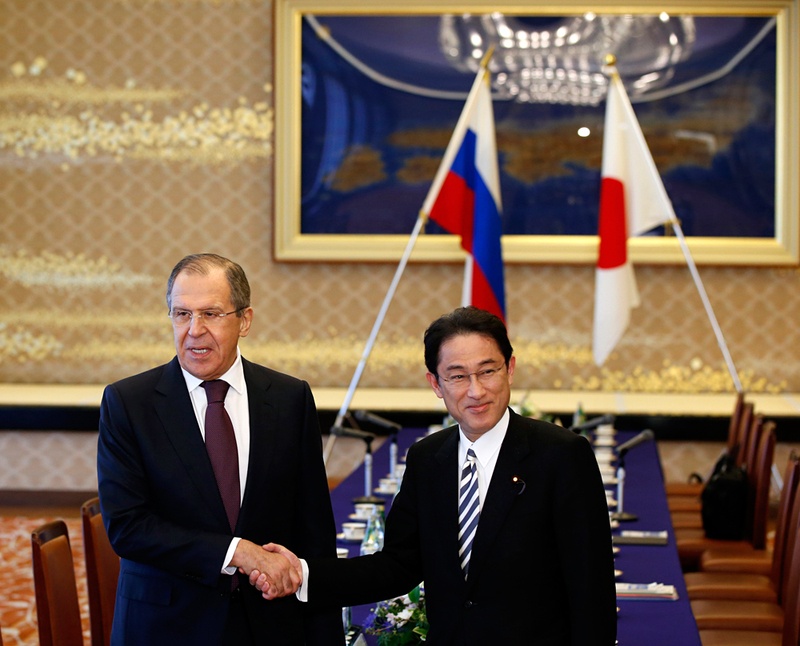 Japanese Foreign Minister Fumio Kishida and Russian Foreign Minister Sergei Lavrov have held a detailed discussion of the problem of a Japanese-Russian peace treaty in the run-up to President Vladimir Putin’s visit to Japan. The talks took place in Moscow on Dec. 3, Yoshihide Suga, the chief cabinet secretary told a news conference on Dec. 5. “A fundamental discussion on the signing of a peace treaty was held,” he said. "It has a direct link to the (forthcoming) summit in Yamaguchi prefecture." Suga said Prime Minister Shinzo Abe received a message, which Putin handed to Kishida at a meeting in St Petersburg on Dec. 2. After his talks with Kishida in Moscow on Dec. 3, Lavrov said Russia and Japan had a number of identical positions on the peace treaty. Russia and Japan have been conducting talks to elaborate a World War II peace treaty since the middle of the 20th century. The main stumbling block is the problem of the Southern Kuril Islands - Kunashir, Iturup, Shikotan, and the Habomai archipelago that went over to the USSR after the end of the war. Japan continues viewing the latter islands as parts of its own territory. Moscow and Tokyo are preparing for Vladimir Putin’s visit to Japan that is scheduled for December 15-16.